Florence is considered to be one of the most historically important cities in Italy for trade and finance, as well as nominated to be its cradle of arts and the birthplace of the Renaissance. 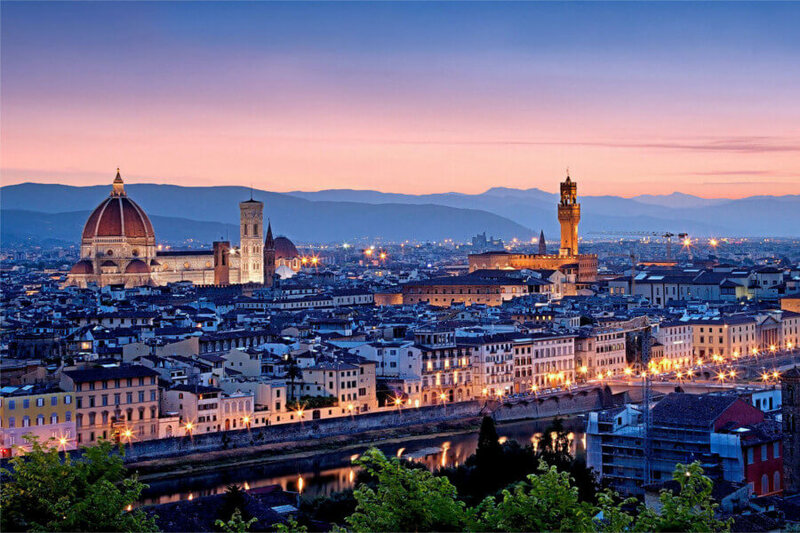 Being cultural centre of the country, Florence is also definitely among the most beautiful cities in the world. The Best Time: Visit Florence from March to June and from September until the beginning of November, these months offer mild temperatures and sunny days. The Good Time: In autumn it is more likely to rain, but in this case things to do in Florence are not lacking: the Uffizi, museums, churches and palaces of the city will be a good shelter! The Okay Time: The summer months of July and August are instead the hottest. If you are coming from tropical countries and could bear hot climate. You will not find anything uncomfortable during summer. The Uffizi Gallery tour is a comprehensive tour of the most important and most visited Italian museum. 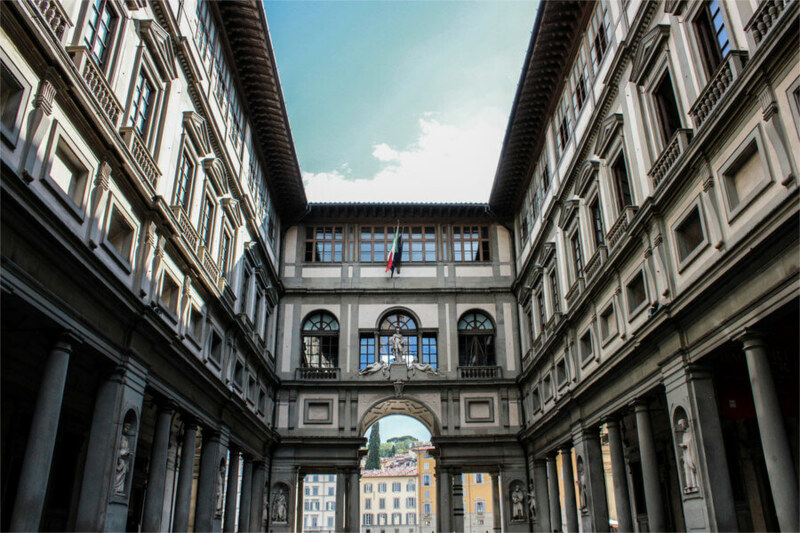 You will walk through a historical building erected by Giorgio Vasari in 1560 as a block of offices (Uffizi) for the public administration of the Grand Duchy of Tuscany, ruled by Cosimo I de Medici. The political facility today contains a gorgeous collection of paintings, such as magnificent works of art by Leonardo da Vinci, Botticelli, Michelangelo, Raphael, Perugino, Giotto, Caravaggio and more. representative of the evolution of arts from the 13th to the 17th century. Experience an exclusive private journey discovering the middle ages to modern day. Pre-booked skip-the-lines tickets by your private guide. Duration: custom designed according to your preference and we will keep the tour interesting for children. We do not offer standard tours and we will custom design the tour to your requests. We take you to walk the streets of the Medici’s, Michelangelo, Donatello, Machiavelli and Dante. Explore the little side streets and discover Florence’s hidden gems. Our private walking tours in the historical centre of Florence can cover all major sites, advanced ticket entry pre-purchased; Uffizi Gallery, Accademia to see David, Vasarian corridor, Palazzo Medici Riccardi, Pitti Palace, Boboli Gardens, Medici chapels just to name a few. Our exclusive tour starts from the Accademia Gallery, where you can admire the outstanding “David”, the “Prisoners” and the “Palestrina Pietà”. Here you will learn about Michelangelo’s life, his early works and his new ideas about “non finito” technique. Our private tour will continues to the Medici Chapels, visiting the New Sacristy, the most famous funeral monument made by Michelangelo for the Medici family: the beautiful statues of Day, Night, Dawn and Sunset and the funeral monument dedicated to Lorenzo il Magnifico and his brother Giuliano. 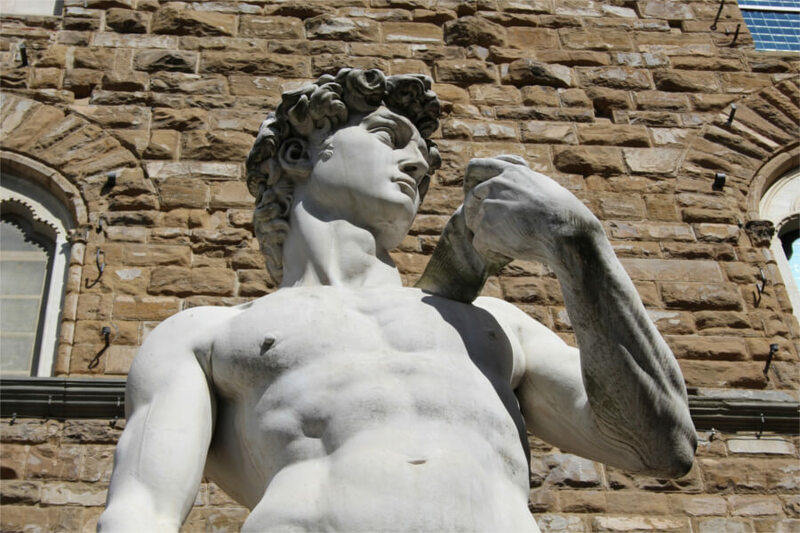 From Medici Chapels walking through the city we will arrive the Cathedral Square and the Signoria Square to see the replica of David and the political city centre of the city. We will end our tour at the church of Santa Croce where you che find the tomb of the sculptor . We can customized your tour according to your personal request. Each neighborhood of Florence has its own particular nightlife scene, which you can enjoy exploring with this Florence at dusk tour. This private walking tour through the Medieval city center, the Dante’s District, will take you to admire the narrow streets, the tower houses, the stories of battles and knights hearing legends and myths of my city. 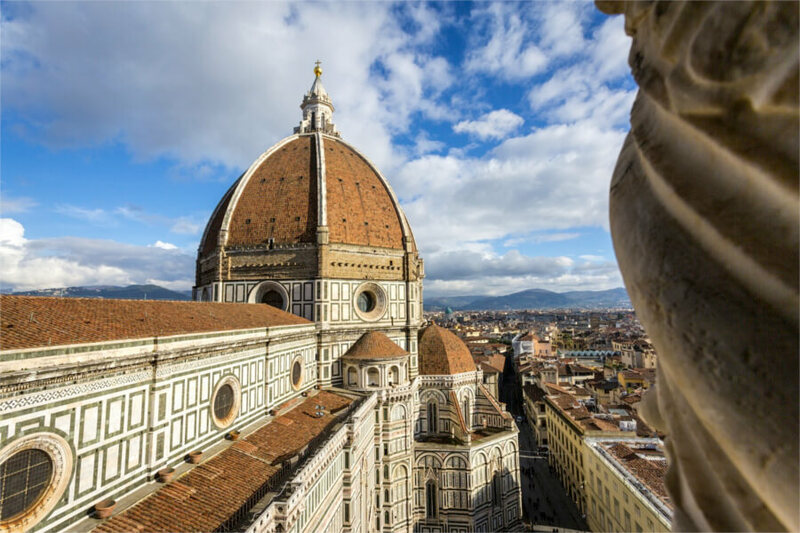 We will explore the Piazza del Duomo, with the big Dome made by Brunelleschi, the high Bell Tower by Giotto and the Baptistery. You will finish by enjoying the atmosphere at a local wine bar with a glass of wine accompanied by appetizer. 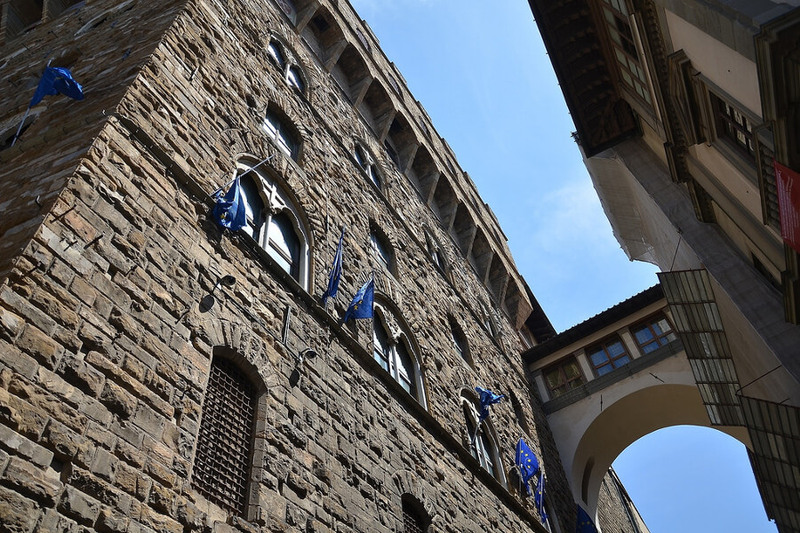 We will stop on the beautiful Ponte Vecchio and I tell you the stories of this ancient bridge, its shops, the secret Vasari Corridor and the World War II. 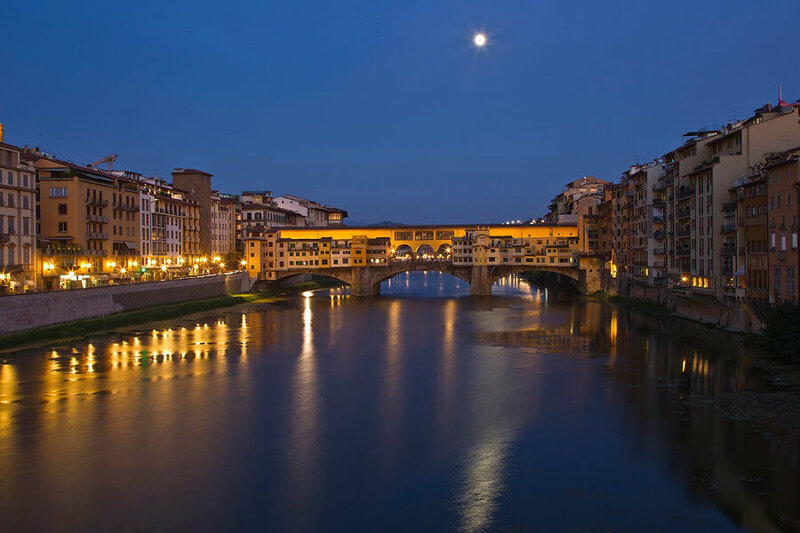 The Arno River with the Lungarno is a spectacular experience at dusk! Tours tailored considering your preference. Florence will be a place of exchange for the most stimulating research in contemporary languages of fashion, visual arts, cinema, photography, advertising, architecture and music. The most innovative artistic phenomena will meet in Florence, those from which fashion often takes inspiration and for which it is increasingly often the source of inspiration and creativity. PITTI IMMAGINE has become the Fashion Gallery to discover the new trends, the new Griffe, Italian and international fashion. It is also an event completely dedicated to Italian style. Save the date next appointment from June 12th to June 15th 2018. One of the main trade fairs for which Florence is famous is certainly the Mostra dell’Artigianato (International Handicraft Fair), which takes place in April inside the Fortezza da Basso. The International Exhibition, now over the seventieth edition, is a showcase and a market of typical Tuscan handicraft products and not only, exposed in the various sections, which offer clothing and accessories, silverware and goldsmithery, furniture, costume jewelry and more. The Maggio Musicale Fiorentino is one of the most prestigious artistic events organized in Florence. It is an annual festival of opera, concerts, ballets and prose shows founded in 1933 on the initiative of the patron Luigi Ridolfi Vay da Verrazzano and the maestro Vittorio Gui. Usually, the initiative takes place from the end of April to the beginning of July. It is an event that is not only a sporting event for Florence, but also a matter of customs and culture. Over the years, the Marathon has now reached an organizational level of absolute excellence and can boast an exceptional stage like Florence. The event is held every year in November. The Florence Marathon is the main road racing event that takes place in Tuscany and, together with Rome, is by now the most important international marathon in Italy and among the top 20 in the world by number of participants and by quality. The Florence Biennale is the main contemporary art exhibition in Florence, it represents a showcase of excellence for contemporary artistic production at the international level. Every two years the city of the Medici hosts a program of events such as conferences, exhibitions, performances and educational initiatives that offer artists and visitors several opportunities to meet and discuss various aspects of art and culture. Exquisite elegant apartment – your home in Florence. 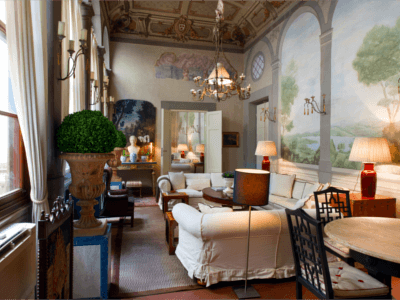 Highlights: Designed by architect Michele Bonan (Gallery Art Hotel, JK Place, Lungarno Suites amongst some of his creations), in a 14th-century Palazzo, just five minutes’ walk from Piazza Santa Croce and Piazza della Signoria. This is our exclusive private apartment for clients, at Allure Of Tuscany we got your tours, travel and accommodation completely covered. Making ourselves different from other travel agents. Apart from our luxury private apartment, we can also arrange accommodation for you in one among the following Hotels in Florence. J.K Palace Firenze is a sophisticated boutique hotel, an ultra-chic oasis located in Piazza Santa Maria Novella in the centre of Florence. An elegant and intimate habitat with a dedication to quality. A vibrant and dynamic yet romantic design and luxury 4 star hotel in Florence, owned by the Ferragamo family, beautifully evolved in the energy of the 50’s. The Hotel Continentale is the place to see and be seen, a catwalk for fashion and desire in the heart of Florence. The elegant and inviting white colors chosen by Florentine architect Michele Bönan evoke harmony, simplicity, and fantasy. Hotel Lungarno is a proud member of Virtuoso and Fine Hotels & Resorts. This stylish retreat of splendid luxury with contemporary design is located in the heart of Florence with spectacular views of the River Arno and famous Ponte Vecchio. Imagine the most wonderful rooms and luxury suites of this luxury 5 star hotel in Florence, softened by beautiful light and surrounded by the reflections of the river Arno and the inspirational atmosphere of the medieval quarters of Florence. 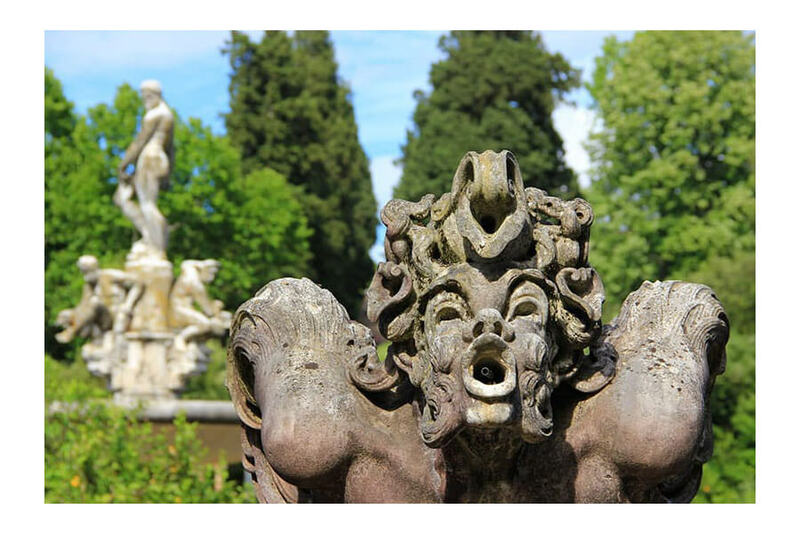 Indulge in a delightful and elegant setting comprising many details of Tuscan artisanship and an extraordinary art collection by Picasso, Cocteau and famous Italian artists. Blending 14th-century artistry with the region’s ethereal beauty, Belmond Villa San Michele is as inspiring as the city’s greatest cathedrals and galleries. Our facade, attributed to Michelangelo, is hugged by lush woodland and terraced gardens. Step outside and gaze down across Florence and to the Chianti hills beyond. Villa San Michele is a feast for the eyes and today it is one of Europe’s most fascinating hotels with spectacular views over Florence. We are dedicated to organize Florence Private Day Tours in Tuscany for individuals, couples, families and groups.